Our favorite non-rigid case is also the best value in non-rigid cases on the market. The ArmorBox Kido gives us enough room to make strong keyguards without compromises, making it our favorite case for use with a keyguard. This case is copied and sold under many different brand names, but the Kido is the best made of them all, with the most consistent fit. It's no wonder that we make more keyguards for the ArmorBox Kido than any other case. 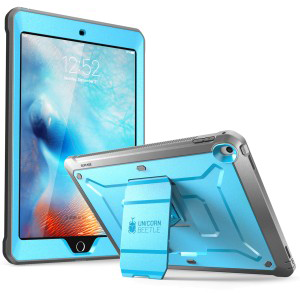 The Kido case was designed with a polycarbonate shell and silicone internal sleeve to provide extreme shock-resistance for the iPad. Its lightweight design makes it easy to be carried by young children without parents having to worry about accidental drops. There is an elevated screen bezel that provides additional safety in the event of the tablet being dropped on its screen. The case maximizes the functionality of your iPad to provide children easy access to all functions and buttons. Our best-selling attachment, the snap-in attachment, is by far the most popular attachment for use with the ArmorBox Kido. Suction tape works great as well, because of the generous room the case leaves us. There's even enough room for suction cups, though they may encroach slightly on some of the openings on some models (like the Mini). Straps can be used to attach the keyguard if the three preferred methods are not acceptable. The Velcro and magnetic attachments do not work with the ArmorBox Kido. The ArmorBox Kido case is our favorite kid-friendly case and can be purchased here. The best value in rigid cases for the iPad, the Supcase Unicorn Beetle Pro is our favorite rigid case for making keyguards. It has a hard shell with an elastic skin that offers good protection, and the Pro version comes with a built-in screen protector. It has an adjustable stand that is very solid. Among the hard shell cases, the Beetle is one of the easiest to take the iPad in and out. Suction cups and the magnetic attachment are not suitable for keyguards in the Beetle case. Suction tape is suitable only on apps that provide adequate room between the cells. Because of the limited height available in this case (or any rigid case), if you are using TouchChat or LAMP Words for Life, we suggest turning the Keyguard Inset setting on in the software and ordering the keyguard with that setting. if you don't turn it on, we may have to add a vertical reinforcement bar in the middle of the speech display. Keyguard Inset is not available on some iPad models. For apps like Proloquo2Go with a large message window right at the top edge, we usually have to add vertical reinforcement bars in the message window. The Unicorn Beetle case is our favorite iPad case for adults and can be purchased here.